This evening’s episode of the BBC program Have I Got News For You was, in my opinion, not as funny as it usually is. I’m a big fan, and have watched for many years. I remember Paul Merton winning when his team-mate was a tub of lard. I remember when Merton & Ian Hislop gave Angus Deaton a roasting over his behaviour shortly before he left the show. I like the satirical take on the weeks events, the guest publication and the caption competition. And this evenings episode looked all set to be a good one. Clare Balding was presenting, Graham Linehan & Ken Livingstone were guests – all sounds promising. And it started well, mocking Tory party conference in the usual style, replaying the clip of George Osbourne being booed at the Paralympics. And then the show took a turn that cannot have been easy to navigate through – Jimmy Saville. It’s been the biggest story of the week, they could hardly leave it alone. Now I’m guessing the show is filmed a few days in advance, because there was no mention of the headstone being removed. And it became a space to vent, not about the horrors of what he is alleged to have done, but also of the way the wider media have responded in particular to the BBC where rumours it seems were rife, yet nothing was done, or even said, officially. This section of the program was light on jokes, but the few that there were were close cutting – Graham Linehan suggested that all the Jim’ll Fix It badges be collected up and melted into a stake to be driven through his grave (and has already had offers on Twitter of badges to get him started). Saville cannot be held to account for his actions, but the climate now is so different. In my work I know that rumour can be so dangerous, particularly in child protection issues, but I hope that if there are lessons to be learned they can be – but I hope things are already in place to stop such a thing happening again. Clare Balding’s remarks about the Daily Mail were spot on, and I hope it makes some people think about there choice of news outlet. It is not acceptable to me to print pictures of teenagers in bikinis then be outraged by paedophiles. I thought the Abu-Hamza joke was in poor taste. 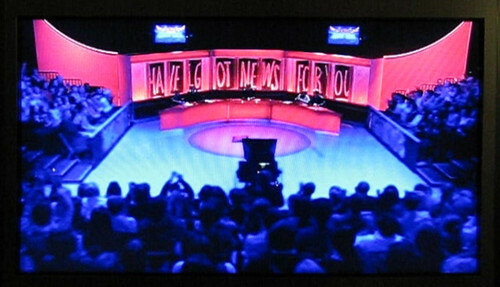 So I’ll tune in again next week – I might even check out Have I Got a Bit More News for You to see what was cut. This entry was posted in blogging, TV and tagged bbc, clare balding, Daily Mail, have i got news for you, hignfy, jimmy saville, racism, sexisim by doobarz. Bookmark the permalink.